In a lot of ways, earbuds are getting better and better. Wireless technologies are improving, charging speeds are improving, and even battery capacity is generally going up. But getting earbuds that take advantage of these kinds of new features isn’t always easy. Especially if you’re trying to do so on a modest budget. When you’re willing to spend a little extra on your earbuds, the rewards are often worth it. Especially if you plan on using your earbuds for some type of niche purpose, like for working out, instead of using them as daily drivers you want to use in a wider capacity. Deciding about these sorts of things is just part of what makes picking a good pair of earbuds so tricky. The Key Series EP-B80 are supposed to be intuitive and simple to use. And for the most part, they manage to deliver on that promise. These earbuds aren’t necessarily made for athletic performance specifically, but they do provide all the essential components to serve as athletic earbuds. That includes the kind of in-ear security you want for active motion while wearing earbuds. But the EP-B80 aren’t only about getting the basics done right. They’re also about making things a little bit more convenient for the user. For instance, the EP-B80 were made with some fairly compelling rapid charge features. They were also built with an above-average array of voice features for people who are interested in utilizing their smartphone voice assistant. But as is true of any pair of earbuds, there’s no such thing as the perfect pair. The EP-B80 aren’t extremely niche in the way they’ve been designed. That can make them a little less attractive for people who are interested in only listening to these earbuds in one type of environment, like the gym. Instead of having that kind of focus, they’re built with a broader range of uses in mind. For people who are going to be using their earbuds more than occasionally, that can be good news. 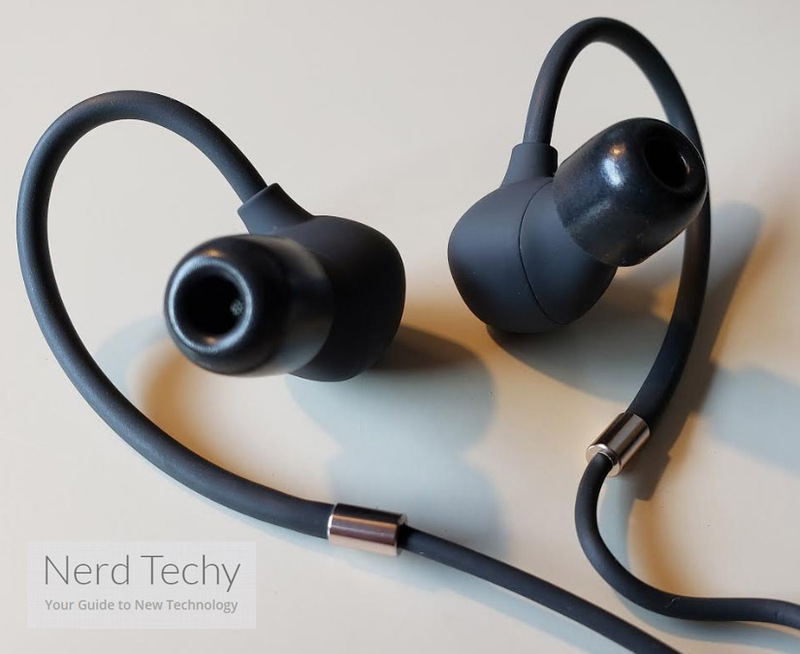 One thing to get out of the way is that these earbuds are driven by USB-C charging. For people who aren’t currently using any USB-C cables in their life, that can be a minor disruption. Especially if it means you end up needing to get cable chargers, with different connection ports on them. Many people have already adopted USB-C into their lives, in one form or another, especially as the format has already taken over smartphones. Having to upgrade to USB-C really shouldn’t be considered much of a negative thing. Because moving over to USB-C also means you’ll find a number of advantages when it comes to charging the Key Series EP. From a style perspective, the EP-B80 have a lot going for them. You can choose between three varieties: red, gray, and black. The red is similar to a firetruck red, while the black is about what you’d expect from a generic pair of earbuds. But the gray is more like a pale white, which helps it to match well with a number of Apple products. 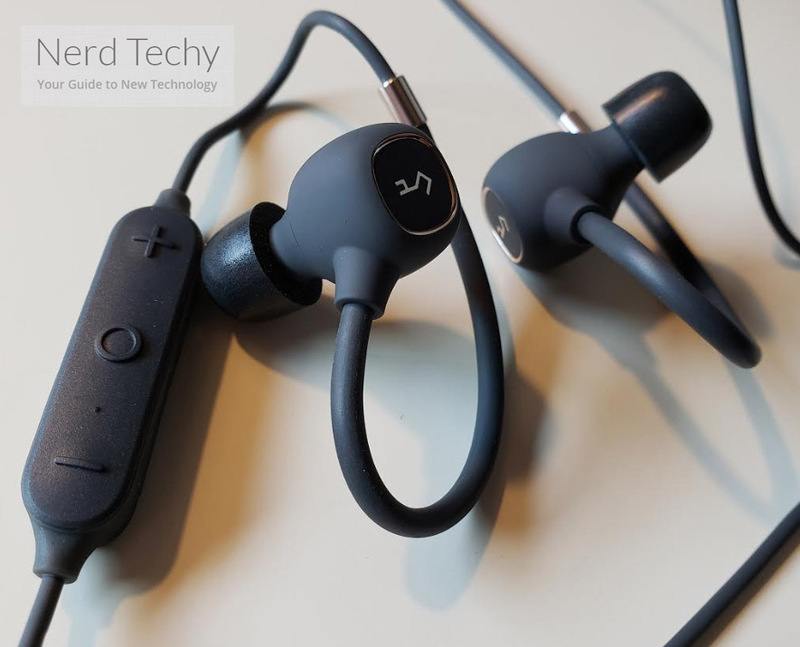 All three pairs are highlighted primarily with the Aukey logo in metal along the side of each earbud, but are otherwise hard to identify as belonging to one brand or another. 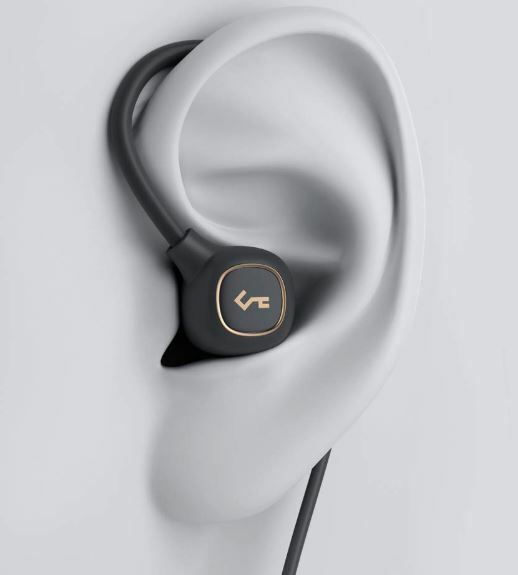 Like you’d hope to find from a pair of active earbuds, the B80 are made to be water resistant. More specifically, the EP-B80 are constructed with an IPX6 waterproofing certification. That basically means you don’t need to worry about rain or sweat coming into contact with your earbuds. But you should still avoid more severe conditions, and certainly shouldn’t throw your earbuds into the sink to wash them off. Consider it more like a water resistance than a proper waterproofing. Along the wire, you’ll find an in-line controller that uses a highly standardized design. The side of the console can pop open to reveal the USB-C charging port. Keeping this port sealed up is actually important if you want to maintain the water resistance of these earbuds. Fortunately, it’s not too difficult to open and close, and its construction should wear extremely well over time. Apart from the charging port, you’ll notice a plus button, minus button, and a button with a circle icon. Like I said, it’s a pretty intuitive layout. Want to raise the volume or skip forward in your track selection? The plus button will help you out. Want to try and lower the volume or rewind your music a bit? Then the minus button will help you out. And of course, the central button primarily handles call features, but it can also play/pause your music. 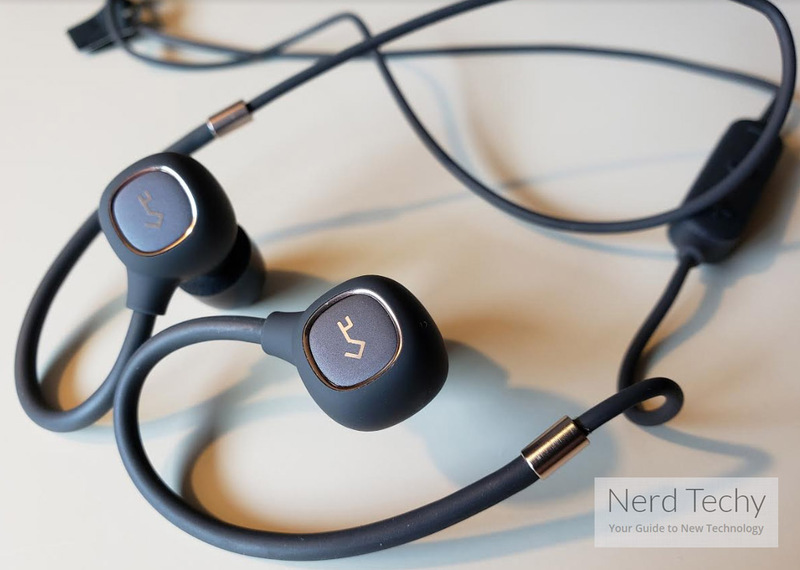 The EP-B80 are actually built a little bit differently from an ordinary pair of earbuds. Because they’re made to be dynamically powered with the aid of balance armature drivers. These drivers aren’t that common because they’re a fairly new technology, and they can still be a little expensive. But the Key Series B80 are actually among the first earbuds to help push BA drivers towards mid-ranged pricing, which is great. BA drivers sound quite distinct from the typical drivers you’ll find used inside most headphones because they’re constructed quite differently. Whether or not you’ll appreciate the difference really depends on your hearing, and your taste in music. But suffice to say these earbuds have a lot to offer when it comes to sound. They’re quite good at presenting a wide variety of different genres in the best possible light. But more specifically, they’re usually good when it comes to the bass range because the bass tones have a nice warmth to them. Meanwhile, the treble range manages to deliver quite well when it comes to clarity, as is partially reflected in the frequency range spanning between 10Hz and 22kHz. That’s actually a touch better than many similar earbuds, though it’s hard to appreciate in an experiential way unless you’re listening to HD audio content. It’s really only at the furthest ends of the audible range of sound where that kind of clarity really comes into play, and not much music goes out that far. Not unless you’re listening to classical, or some types of electronic music. If you were looking for earbuds that performed similar to the B80, but had a definitively more robust bass section, you’d have to start thinking about running earbuds like the Back Bay EQ 40. However, you’d also start to encounter a number of serious battery issues along the way because it can be tough to make portable audio sound pristine without burning through energy doing it. When everything is fully charged, these earbuds can provide about eight hours of playback. Whether or not you reach eight hours depends on a wide variety of different factors. You might end up getting less playtime because it’s cold in your environment, or because you’re listening to your earbuds with the volume raised to their limit. You might also get a little more time if you take many calls. Because calling actually uses less power than music, in most circumstances. But all in all, the eight-hour estimate is pretty close to accurate. Once you’ve drained the battery, the EP-B80 make use of their USB-C port for a recharge. Using this port allows them to draw about 80 minutes’ worth of listening time from about 10 minutes of recharging. For people who don’t always remember to recharge their earbuds, that can be fantastic. Because it means in a worst case scenario, you can still squeeze out enough time to finish your cardio, or make a quick run across town. 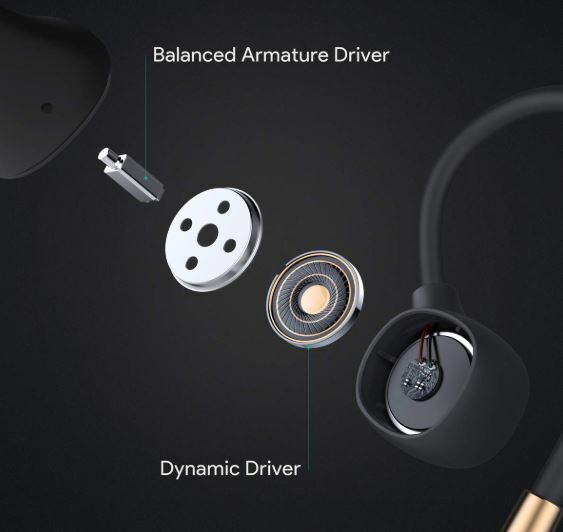 Like nearly all of the latest generation of earbuds, the Key Series B80 are made to support Bluetooth 5. That support comes with a number of neat advantages, especially when it comes to saving battery life. 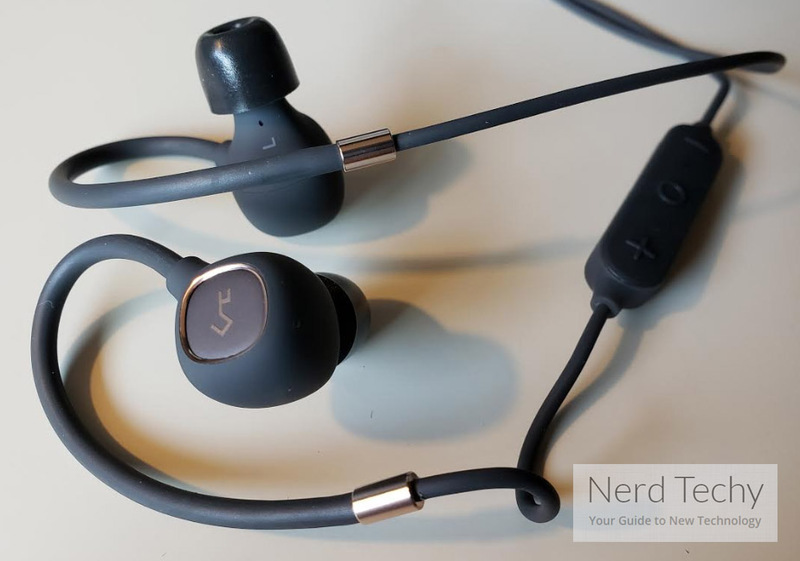 These earbuds also deliver on the Apt-X Low Latency codec, helping ensure that your connection runs smoothly, and without lowering the quality of your audio in exchange for that smoothness. As mentioned earlier, the Aukey Key Series are constructed with native voice assistant features. Even when voice assistants are not natively supported by earbuds, it’s typically possible to get them working. It just takes a little extra configuration. But with native support like the EP-B80 delivers, those kinds of added steps are removed. You can pretty much start barking out voice commands from the moment you first connect to Bluetooth, which makes things just a little bit easier for you. 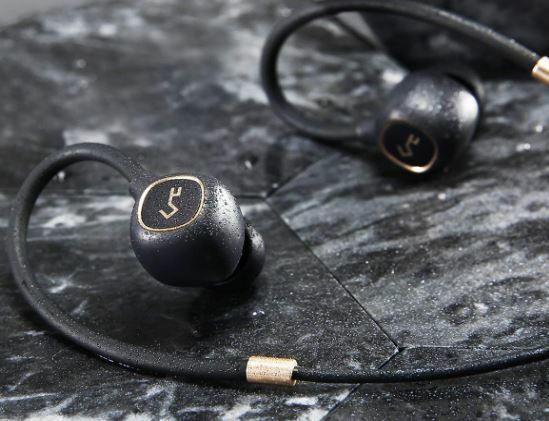 You’ve probably noticed that these earbuds have a wired-based ear-hook design, which loops up and around the ear. This slightly widened wiring has been padded with a layer of smooth silicone that’s equal parts firm and flexible. The material is quite comfortable against the skin. Though it might be a stretch to call these a universal fit, it would really only be small children that might have a problem with getting the ear hooks to sit just right. Putting aside the ear hooks, these earbuds include three pairs of silicone ear tips, and three pairs of memory foam ear tips. Having three pairs of silicone ear-tips at your disposal is pretty standard, but it helps ensure you end up with a comfortable fit. Having memory foam eartips is somewhat less standard. But for people who are willing to swap over to those alternative tips when needed, the extra noise isolation can actually make a really big difference. 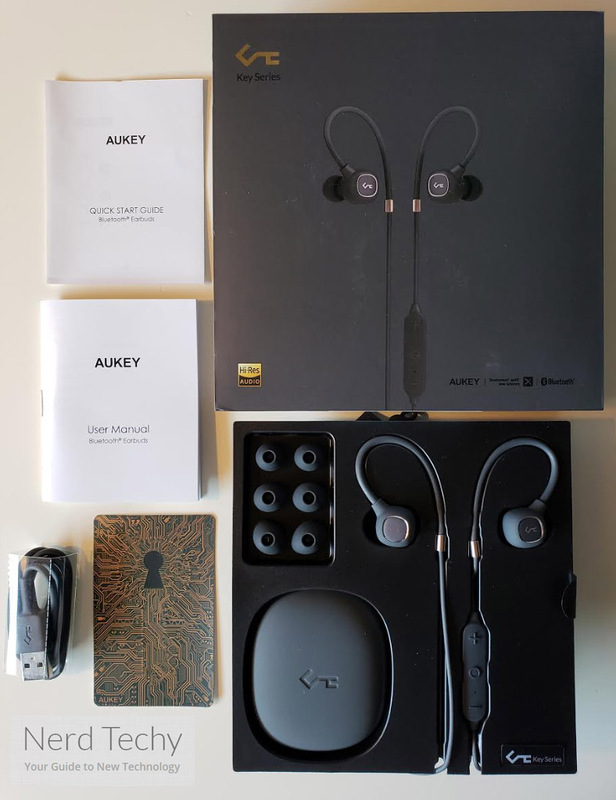 The Aukey Key Series BP80 includes the earbuds, three pairs of memory foam ear tips, three pairs of silicone ear tips, a USB-C to USB-C charging cable, user manual, carrying pouch, and a two-year warranty. The carrying pouch is nothing special, but it does help you manage the wire that runs between the earbuds a little easier. Who Should Choose Aukey Key Series EP-B80? 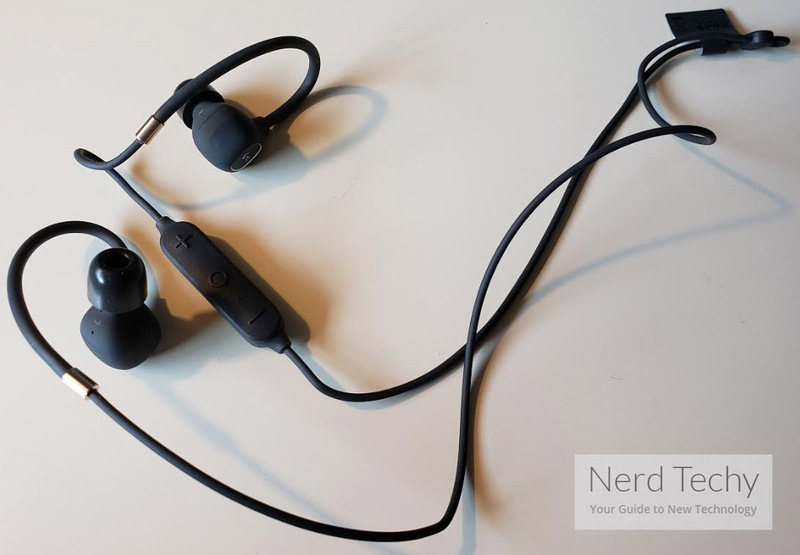 When you’ve got them in your ears, the Aukey EP-B80 are enormously secure. Far more secure than earbuds that don’t rely on an over-ear hook design. This allows them to stay in your ear without having to squeeze quite so tightly, which is fantastic for comfort. It’s not as great for noise isolation, but if that becomes a concern, the memory form ear-tips are there. With respect to their battery lifespan, the EP-B80 are just above average. It would be hard to improve upon them without carrying some kind of battery power station with you. Perhaps more importantly, their audio quality is slightly remarkable. No, it’s not audiophile quality. But it’s just a bit different from the sort of audio that you might be familiar with hearing from standard audio drivers. BA drivers have a unique quality that really attracts people to them, and whether or not you’re a fan of that sound profile, it’s clearly present with the EP-B80.